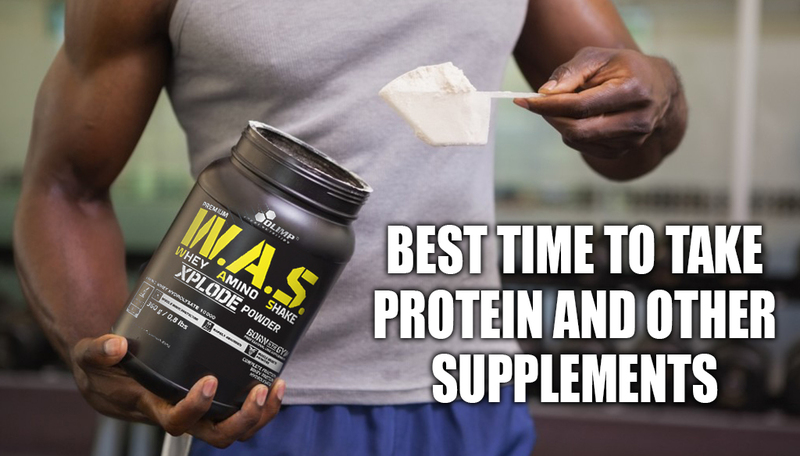 We take a look at the best times to take protein as well as other workout supplements so you know how to maximize your ability to get the most out of them. – Most importantly, take protein right after your workout. This is when your muscles are primed for a nutrient that will help them recover and grow. Many experts agree that this post-workout protein window is around 30 to 60 minutes. – Before you sleep. Eating some protein before you go to sleep provides your body with the fuel it needs. Think about it – you sleep for about eight hours and consume nothing. Give your body some protein right before bed to allow it to use it for recovery and growth. – When you awake up. Similar to the above, you’ve just gone eight hours without any protein – give your body what it wants when you wake up. – 30 minutes before your workout. Taking protein before a workout is important as well. Taking protein half an hour before you hit the weights provides your muscles the added fuel they need to perform at maximum capacity. Creatine helps to supply energy to all the cells in the body, primarily muscle. It is used by athletes who want to enhance muscle mass as well as improve energy during workouts. For the best results, take creatine about a half an hour before a workout and right after a workout. Like protein, creatine is thought to help prevent muscle breakdown and helps to improve recovery. Taking it before and after a workout is said to be the optimum time to help maximize workouts and recovery. Glutamine is an amino acid found in muscles that is said to be responsible for their strength, stamina and recovery. As the most common amino acid it comprises 61 percent of skeletal muscle, and increases your ability to secrete Human Growth Hormone (HGH), metabolize fat and prevent the breakdown of your muscles. Taking five grams before bedtime has been shown to raise HGH levels significantly, and this is considered to be the optimal time to take the supplement. Like protein and creatine, taking glutamine after your workout is also recommended, as is taking it once you wake up from a night’s rest.